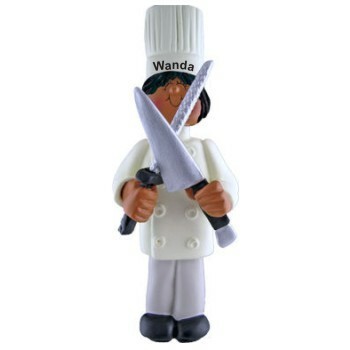 Whether her goal is to be a top chef, have a cooking show on TV or start her own catering business, you can celebrate her wonderful achievement with the African American female culinary school graduate personalized Christmas ornament. We'll hand letter her name on the hat to make this a memento she'll always treasure. Encourage your favorite new graduate toward reaching her dreams with the female culinary school graduate ornament, one of several African American ornaments we feature for African American students that arrives in our custom velvet pouch.